Memory foam mattresses usually have the highest ratings for comfort, durability, and customer satisfaction. One of the only complaints owners have is about memory foam smell. This unpleasant odor is caused by the materials used to make the mattress and lasts up to 4 weeks. The good news is that some mattress brands make their foam from better components that reduce or eliminate memory foam smell. This article explains how, and tells you what to look for to make sure your mattress comes odor-free. These "volatile" (or unstable) compounds break apart, mostly forming gasses. Is off-gassing from memory foam toxic or dangerous? The short answer is no. While the odor from mattress off-gassing is unpleasant,for most people it’s not harmful. A small percentage of owners report difficulty breathing, headaches, nausea, eye and throat irritation, and asthma. The symptoms stop when the person is no longer near the mattress though, and go away once it airs out. Also, despite the fact that some of the chemicals that cause mattress off-gassing odors are classified as carcinogens or potential carcinogens, no studies have shown memory foam is toxic or causes cancer. Still, many people choose to reduce their chemical exposure as a lifestyle choice, and want to sleep on a mattress as chemical-free as possible. is toxic or causes cancer. How can I avoid memory foam smell and off-gassing? While a completely chemical-free mattress doesn't exist, you can limit your exposure by finding one containing foam certified by CertiPUR-US®. CertiPUR-US® independently tests and verifies which foams are made without harmful VOCs, phthalates, CFCs, heavy metals, formaldehyde and PBDEs. Also, plan to let the bed air out for 3-7 days in a well-ventilated room or garage before use. Not only does the foam in Amerisleep mattresses meet the Certi-PUR® standards, but we also use plant-based materials instead of petroleum to make our foam. On top of that, our patented manufacturing process is the only one that meets the standards of the Clean Air Act. No other mattress brand is more sustainable or eco-friendly than Amerisleep. Each memory foam mattress brand uses different materials and methods to create their products. That means some have significantly more problems with mattress off-gassing than others. Research has also connected higher density foams with increased rates of odor complaints. Therefore brands using foam over 6.0lbs will likely smell worse. Unfortunately most mattress brands prefer to limit the information they share about what goes into their products. They claim it is to protect their trade secrets. That also makes it hard for consumers to feel confident they are choosing a relatively chemical-free mattress though. Looking for certification from independent organizations like Certi-PUR® can help. Because they independently test mattresses for VOCs and other chemicals, they give prospective buyers the information they need to make the best choice. 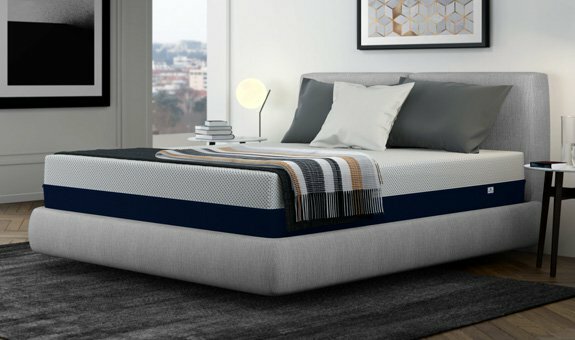 Amerisleep mattresses meet CertiPUR-US® standards for content, emissions and durability, and are analyzed by independent, accredited testing laboratories. Mattress off-gassing refers specifically to odors from the breakdown of VOCs. A new mattress can also have other smells unrelated to memory foam off-gassing though. Even products like plant oils and natural fabrics can produce some smell. If you buy a mattress low in VOCs (like from Amerisleep) and it still has a slight scent, don't worry. It’s probably not memory foam off-gassing, and will often quickly go away. Learn how Amerisleep memory foam compares to other memory foam.